We’d love your help. Let us know what’s wrong with this preview of King of Shadows by Susan Cooper. WHAT'S NAT DOING IN SHAKESPEARE'S TIME?Only in the world of the theater can Nat Field find an escape from the tragedies that have shadowed his young life. So he is thrilled when he is chosen to join an American drama troupe traveling to London to perform "A Midsummer Night's Dream" in a new replica of the famous Globe theater. Shortly after arriving in England, Nat goes to WHAT'S NAT DOING IN SHAKESPEARE'S TIME?Only in the world of the theater can Nat Field find an escape from the tragedies that have shadowed his young life. So he is thrilled when he is chosen to join an American drama troupe traveling to London to perform "A Midsummer Night's Dream" in a new replica of the famous Globe theater. To ask other readers questions about King of Shadows, please sign up. Carter Playz Nat is an orphan that was adopted by the Fisher family and went to London to join an acting group called “The Company of Boys”.“The Company of Boys”…moreNat is an orphan that was adopted by the Fisher family and went to London to join an acting group called “The Company of Boys”.“The Company of Boys” were going to act in A Midsummer Night’s Dream. Nat gets very ill and falls asleep, waking up somewhere else in a different year. He is in 1599 and acts in A Midsummer Night’s Dream but with Shakespeare. A reason why I liked the book is that I loved the way the book was made and the fact that Nat went back in time. Something cool aswell was that the author Susan Cooper actually made it was that in 1499 they talked like how they talked in the book. I learned a lot from this book and it was great. What I enjoyed the most in the book King of Shadows was the transitions that Susan Cooper wrote when Nathan Field, the main character, would go back in time or into the present. Now the reason why this book got 3.5 stars out of 5 is that a book is obviously not perfect. There were some spelling mistakes and some parts were confusing. For example, another reason why I didn’t like it is because you read about the book and how the rehearsals go and then Nat goes back in time and does the play then and then goes back to 1999 and has to do the play all over again. I feel like it was just a whole waste of time reading the end, I didn’t like it. Also, the explanation for his time travel jump at the end made me mad because I feel like the only reason that Arby chose Nat to act with his cast is so Shakespeare wouldn’t die and Arby could do the play. I would definitely recommend this book to anyone but for some young readers I'm not sure. What I am talking about is that two to three times the author would put in inappropriate language and that would be good for people that are young to reader. King Of Shadows by Susan Cooper was surprisingly a good book. Normally the summer reading books at my school are trash but this book was amazing. I gave this book 3.5 stars out of 5. Teenaged 20th century Shakespearean actor Nat Field's sojourn in historical 16th century London as an apprentice (under William Shakespeare's tutelage) in the at that time newly constructed Globe Theatre (having been mysteriously transported back in time from the 20th century, well actually, having been made to switch places with a 16th century apprentice of the same name ill with the bubonic plague) is for all intents and purposes an engaging, fun, and delightfully informative romp. Author Susa Teenaged 20th century Shakespearean actor Nat Field's sojourn in historical 16th century London as an apprentice (under William Shakespeare's tutelage) in the at that time newly constructed Globe Theatre (having been mysteriously transported back in time from the 20th century, well actually, having been made to switch places with a 16th century apprentice of the same name ill with the bubonic plague) is for all intents and purposes an engaging, fun, and delightfully informative romp. Author Susan Cooper knows her history, and 16th century London remarkably and magically comes alive under her pen (from the sights, the sounds, even the smells of the city to how the Globe as a theatre works, how it is run and managed). And having Nat speak in an Appalachian drawl, read dialect, is really and truly an ingenious narrative device, considering that many linguists now surmise that standard Elizabethan English would have sounded rather similar to the dialects and parlances of Appalachia (and this factoid, of course, smoothes out potential problems of communication and comprehension, as Nat Field due to his background, due to his hailing from Appalachian Tennessee, is able to for the most part easily communicate in 16th century London, whereas a more standard modern American vernacular would likely sound very strange and perhaps even incomprehensible to a 16th century Londoner). Although I personally simply enjoyed and continue to much appreciate King of Shadows as basically an entertaining time travel fantasy (about one of my favourite playwrights), there are nevertheless some rather heavy and potentially saddening issues and scenarios presented. Nat is not just a talented young American Shakespearean actor, he is dealing with much sadness and trauma (grief, loss, mental anguish both in the present and also later in the past, as the warm and nurturing father figure he encounters in William Shakespeare is torn from him when he is, and against his wishes and desires, simply transported back to the present time once the reasons for which he was catapulted into the past in the first place no longer exist). Now as a child reader, or perhaps more precisely, as a Middle Grade reader, as I believe King of Shadows is suitable from age eleven or so onwards, I would likely have simply taken and accepted the above mentioned reasons as to why Nat Field has to be switched with his namesake and Elizabethan counterpart Nathan Field as a basic and yes, even logical given (that because the historic, Elizabethan Nathan Field is ill with the bubonic plague, he might easily infect and likely kill William Shakespeare and thus destroy his literary legacy and fame). However, my adult self is a bit more jaded, cynical and fond of basic logistics. And if Shakespeare catching the plague from Nathan Field would kill him and thus prevent him from penning many of his most famous plays, then these plays should really by simple logic not even exist in the present day (and they do, but are deemed as threatened and in need of rescuing so to speak). The protagonist, Nat Field, is a young actor who has come over to play at the Globe with his company. Somehow he goes to bed feeling ill and then wakes up in Shakespearean England. With Shakespeare. The rest of the novel is concerned with his adventures in this time period and also what happens when he returns to his 'normal' life. And like I said, it's very very good. There's a heartrending moment when Nat almost falls in love with Shakespeare and Cooper conveys this hero worshi Oh this is good. And like I said, it's very very good. There's a heartrending moment when Nat almost falls in love with Shakespeare and Cooper conveys this hero worship with kindness and a light, nonjudgemental touch. There's a lot of warmth throughout the text, Nat and his love of his work, and Cooper and her patent love for Shakespeare. The ending is excellent, genuinely so, but I can see how it may prove divisive. It's admittedly stagey but that reflects the topic of the book quite well so I felt it fitted. This is the only part where it lost a mark for me. One of my pet hates with time-travel or historic books is that the side detail overwhelms the central thread of the story. Didn't happen here. What detail there was was very seamless and nicely interwoven. Good work all round and well worth a read. This is excerpted from a review I wrote for the now-defunct Riverbank Review. Susan Cooper, who won the Newbery Medal for The Grey King (of the Dark Is Rising sequence) has full control of her magic. In King of Shadows (the title of the book comes from Midsummer Night’s Dream) she shows that she understands the magic of the theater; how a group of people in an enclosed space can make the impossible happen. In this splendid novel for young people, she has translated this understanding into a ravis This is excerpted from a review I wrote for the now-defunct Riverbank Review. Susan Cooper, who won the Newbery Medal for The Grey King (of the Dark Is Rising sequence) has full control of her magic. In King of Shadows (the title of the book comes from Midsummer Night’s Dream) she shows that she understands the magic of the theater; how a group of people in an enclosed space can make the impossible happen. In this splendid novel for young people, she has translated this understanding into a ravishing story. The tale wobbles a bit at the end, with Nat’s being sent to keep the plague from Shakespeare, that he might go on to write the rest of his plays. However, the power of words to move and to heal, the joys of being on stage and making the magic happen, and the richness of one boy’s connection to the greatest of English writers, is perfectly, limpidly clear. A well written tale of time travel wrapped around some of Shakespeare’s most famous works. The central character, Nat, is a member of a theatre troupe for boys who perform Shakespeare’s plays as they are meant to be performed- at the Globe Theatre in London with an all male cast. They will be performing ‘A Midsummer Night’s Dream’ and Nat has been chosen to play the part of Puck. During a warm up exercise, Nat begins to feel very dizzy and sick and blacks out. Upon awakening he finds himself tra A well written tale of time travel wrapped around some of Shakespeare’s most famous works. The central character, Nat, is a member of a theatre troupe for boys who perform Shakespeare’s plays as they are meant to be performed- at the Globe Theatre in London with an all male cast. They will be performing ‘A Midsummer Night’s Dream’ and Nat has been chosen to play the part of Puck. During a warm up exercise, Nat begins to feel very dizzy and sick and blacks out. Upon awakening he finds himself transported back to Elizabethan England where he learns to adjust to his new life and even meets William Shakespeare himself! Shakespeare instantly takes a shine to Nat and touts him as his best performer. Back in modern day England however, Nat’s Elizabethan counterpart with whom he has swapped lives lies in hospital suffering from bubonic plague. Once this has been cured (just long enough into the novel for the original Nat to become emotionally attached to Shakespeare) the two lads are shunted through time again to their own centuries where Nat struggles to acclimatise to his surroundings and misses Shakespeare desperately. The twist ending is an unexpected touch and explains the reasons for time travel well. I highly rate this book as a good way to get younger students interested in Elizabethan history and introduce them to the works of Shakespeare. Although it can be a little gruesome in places, Cooper writes with fantastic accuracy about what Elizabethan life would actually be like, especially through the eyes of a modern day child. There is however room for character development of Elizabethan Nat although this opens doors for a class project along the lines of ‘imagine you are Elizabethan Nat transported to modern times. Write a diary entry as if you are him explaining how you feel and how life is different for you’. The suggested age range for this book would be 10-11 years and could be used in a variety of ways in the classroom. Described above is one option, or it could be also used in a history project on the differences between Elizabethan and modern life. I love this book as much as i love Shakespeare which is a LOT!!!!!!! It's a 5 star rating by far. When Nathan (the mane part beside Shakespeare) leaves the wonderful play write Shakepear i cried and i garenty you will to. Nat has a tragic past but now has been chosen to be in an elite group of American boys and men who are going to act in the new Old Globe, Shakespeare's own theater in England. They are going to do it the old fashioned way with boys playing the parts of women. While he is boarding with a kind family who puts him up while he is at the Old Globe (well, the new one), he gets mysteriously ill and ends up actually working at the original Old Globe, from 500 years prior to his life. What has happened? Nat has a tragic past but now has been chosen to be in an elite group of American boys and men who are going to act in the new Old Globe, Shakespeare's own theater in England. They are going to do it the old fashioned way with boys playing the parts of women. While he is boarding with a kind family who puts him up while he is at the Old Globe (well, the new one), he gets mysteriously ill and ends up actually working at the original Old Globe, from 500 years prior to his life. What has happened? Will he ever recuperate from the trauma in his life? He gets to act Puck in Midsummer alongside the actor who does Oberon...who happens to be the author of the play. What has caused this switch? Will he ever get back to his time? Will he ever feel whole again? Rating: Probably a 4.5 if we're going to be exact. Goodness, but this book is even better than I remembered. This is excellent storytelling with extremely interesting characters (well, mostly Nat and Shakespeare, but the others are all right). As a first-time reader of the novel, I was fascinated with the descriptions of Elizabethan England. This time I was especially drawn to the characterization for Nat and Shakespeare, and to the details about the "magic" of theater (something I appreciate a lot more now than I did as a teenager). I was a little disappointed at the end of the novel when Cooper simultaneously wrapped up a lot of loose ends (e.g. "how/why did Nat get sent back through time?") and also left some things to suggestion (like how (view spoiler)[Arby somehow manipulated circumstances to have Nat sent through time. With this foreknowledge, he seems almost like an Old One from Cooper's "Dark is Rising" series.) (hide spoiler)]. However, at the same time, Cooper handled those ends so well that I can't really be too upset. Random thought: Nat and his Aunt Jen still sound quite British, despite supposedly being American. Then again, if I wrote a book, I'm sure that all my characters would sound like my native nationality, so I should stop complaining. Cover art critique (because why not): I think the cover picture here (with a half-Elizabethan Nat, and half skateboarder Nat) is aggravating and doesn't succeed in trying to attract young reader's attention. Nat doesn't look "cool" enough and he doesn't look intrigued; Cover-Nat looks like he's annoyed to be in the book. My favorite cover (the one I saw that, as a teen, attracted me to the book in the first place) showed a shadowed figured against a spiral of light. Much cooler. Thankfully, either aforementioned cover is better than the eyesore I saw elsewhere on the Internet, with a cracking Shakespeare bust and rats. Rats? Really? I had read this book years ago and decided that my good memory of it was worth going back and trying it again. I was right. This is one extremely well researched, thought out, and written book. Nat Field is a young actor recruited by a somewhat mysterious man named Arby to play Puck in Arby's version of "A Midsummer Night's Dream". The company of actors are all boys aged 11-18. They will play in the brand-new reproduction of Shakespeare's Globe. Just before the play opens Nat falls ill. He is tak I had read this book years ago and decided that my good memory of it was worth going back and trying it again. I was right. This is one extremely well researched, thought out, and written book. Nat Field is a young actor recruited by a somewhat mysterious man named Arby to play Puck in Arby's version of "A Midsummer Night's Dream". The company of actors are all boys aged 11-18. They will play in the brand-new reproduction of Shakespeare's Globe. Just before the play opens Nat falls ill. He is taken to the hospital where he is diagnosed with bubonic plague. Meanwhile Nat wakes up in 1599, four hundred years before his own time. Everyone believes him to be Nat Field from St. Paul's school, loaned to Shakespeare's company to play Puck to Shakespeare's Oberon in a very important performance of the "Dream." Shakespeare and Nat quickly connect, forming a strong personal bond. Nat, who has suffered much loss in his life, is a kindred spirit to Shakespeare, who recently lost his son Hamnet. Their relationship is one of the most believable and warm parts of the book. Cooper's Shakespeare is one you want to be the real Shakespeare. The company is nervous as it is believed that Queen Elizabeth I herself may come to see the play. But the big day arrives and all goes well. Nat, a boy from 1999, meets Queen Elizabeth. After the play Nat realizes that his current situation cannot stay the way it is. Nat Field will be returning to St. Paul's where Nat will instantly be rejected. He promises Shakespeare to come back when he is grown and act with him again. I had to read this for school. I'm not saying it was a terrible book, but I don't really think it was worth my time. If I hadn't been assigned it for school and if half my grade hadn't depended on it, I would never have picked it up. It was a book for a twelve-year-old, not a high school student. It had an awesome storyline, good characters and a great ending, but it just lacked addictability. I fell asleep reading it. Maybe its because our teacher forced us to read it and said 50% of our grade depe I had to read this for school. Maybe its because our teacher forced us to read it and said 50% of our grade depended on it. Maybe that's what made me dislike this book. I don't know. It wasn't torture, but it also wasn't bliss. I never shook with excitement, got butterflies in my stomach and it definitely wasn't a topic I would discuss with friends. For once, a book was just a book. For me, books are fantasies and journies, an escape when the world is hard. But this one was just words on a page, nothing more, nothing less. Sorry all of you people who loved it. I'm still confused about Arby though. What was goin on there? Nat's been chosen for an elite all-boys acting troupe called The Company of Boys, made up of kids from all over the United States. They're rehearsing two of Shakespeare's plays—A Midsummer's Night Dream and Julius Caesar—which they'll perform in London at the New Globe Theater. But something's strange. And then Nat wakes up in 1599, in the place of another Nat Field, who's also in the role of Puck. And his Oberon will be played by William Shakespeare himself. Training camps and dress rehearsals. Nat's been chosen for an elite all-boys acting troupe called The Company of Boys, made up of kids from all over the United States. They're rehearsing two of Shakespeare's plays—A Midsummer's Night Dream and Julius Caesar—which they'll perform in London at the New Globe Theater. But something's strange. And then Nat wakes up in 1599, in the place of another Nat Field, who's also in the role of Puck. And his Oberon will be played by William Shakespeare himself. I did not particularly enjoy the book. Nat randomly going back in time was not a believable story and I was unable to attach to any of the characters. Susan Cooper used way too many lists. Review to come in March. Book Battle book. King of Shadows is about eleven year-old Nat, an aspiring theater actor who wakes up one morning and realizes he has gone back four hundred years in time to 1599 and has to act alongside William Shakespeare (!!!). And yes, Nat is just as freaked out about that time jump (and Shakespeare) as you would imagine. Nat is really personable and I really grew to like him by the time I finished reading. I will admit that I Review to come in March. Book Battle book. He put his arm over my shoulders and gave me a quick hug. And to my absolute horror, I fell apart. It was the sudden warmth and sympathy, the fact that somebody understood – and not just anybody, but him. I heard myself give a great big ugly snorting sob, and suddenly, hating it, I was in a flood of tears. This book is a well written little jaunt into the past. The ending is interesting and makes me wonder if it could be tied in with The Dark is Rising! Not the most complex plot, but interesting nonetheless. I suppose it could do with some more period detail, but it's a children's book, so the question is whether the target audience would be that interested in that. I'm a sucker for time slip novels and this is a great one about an American boy actor on a visit to London who changes places with a boy actor of the same name from Shakespeare's time and acts on stage at the Globe with Shakespeare himself. Probably aimed at around age 12 and I'm not sure most kids would pick up the emotional impact of the father-figure aspect to the story, but I loved it. I loved this book so very much. It stayed on my mind for months after I read it. It's been about 13 years since I read King of Shadows, and I still find myself thinking about it sometimes. It is a beautiful, somewhat heart-wrenching, read. Very serviceable story of a young actor who goes back in time and acts in Shakespeare's Globe. A quick read. Not brilliant but it does convey some of the sights and smells of Elizabethan London well. Good one for younger readers. OH. This is one of those books that didn't become 5 stars until the very end, but it was WONDERFUL. What an indulgent read this was for me. How enjoyable it was to read of the boy traveling back in time and getting to work with Shakespeare. Great fantasy. Este libro fue una lectura obligatoria del colegio en la que el único objetivo de su lectura era el comenzar a acostumbrarnos a la lectura en un idioma ajeno a nuestra lengua materna. 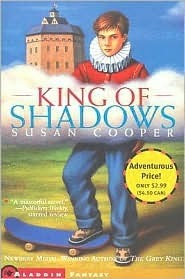 King of Shadows by Susan Cooper is a historical fiction novel describing a young actor’s travels to the year 1599. Nat Field is a young boy from Falmouth, Massachusetts. He loves acting and is traveling to London with an elite all-boys troupe to perform in a newly erected theater just like the one Shakespeare used. However, the night he arrives, he falls ill. When he wakes up, he soon discovers that he’s in sixteenth century, Elizabethan London! He is now a sheltered boy from St. Paul’s, an act King of Shadows by Susan Cooper is a historical fiction novel describing a young actor’s travels to the year 1599. Nat Field is a young boy from Falmouth, Massachusetts. He loves acting and is traveling to London with an elite all-boys troupe to perform in a newly erected theater just like the one Shakespeare used. However, the night he arrives, he falls ill. When he wakes up, he soon discovers that he’s in sixteenth century, Elizabethan London! He is now a sheltered boy from St. Paul’s, an acting school only for the rich. And he also finds that he is on loan to Shakespeare, his idol? He soon must perform with the rest of the actors, and in front of Queen Elizabeth too. Developing a special bond with Shakespeare and having the time of his life, Nat starts to worry about what will happen after the play, and what happened to his own world. I'm not saying this book was terrible, I just don't think it was worth my time. It may just be because I read this for school and therefore had to analyze the ever loving crap out of it, but this book quickly lost my interest. It wasn't for lack of quick plot or uninteresting characters (actually, that may have been a contributing factor). I found the problem to derive mostly from the fact that there was nothing huge to analyze. Yes, it had its underlying themes and messages and whatnot, but I f I'm not saying this book was terrible, I just don't think it was worth my time. It may just be because I read this for school and therefore had to analyze the ever loving crap out of it, but this book quickly lost my interest. It wasn't for lack of quick plot or uninteresting characters (actually, that may have been a contributing factor). I found the problem to derive mostly from the fact that there was nothing huge to analyze. Yes, it had its underlying themes and messages and whatnot, but I found examinations to be very surface level and well-childish. I would give the author the benefit of the doubt and say that this book wasn't for my age range if not for the fact that it was assigned to me. It was neither bliss nor torture, this book. Never did I shake from excitement or have butterflies in my stomach. The only time I would have discussions about it with my friends was in class. For once, this book was just a book, and that was its down fall. I use books as an escape from all of the things going on around me, all of the stressors, all of the people, especially those set in a place unlike my own such as historical fiction or fantasy. It was supposed to take me away, sweep me into a world of chamber pots and Shakespeare, but all I felt was, at best, mild interest. I do have to give the author credit for her vivid descriptions of the Elizabethan Era though. If Cooper's plot was enough to draw me in, I would have felt as if I were right there along with Nat and the other Chamberlain Men. From the old-fashioned sights to the horrible smells, she captured it all! Her most grevious downfall would have to be the ending. (view spoiler)[ There were many lose strings and in some ways, I felt the conclusion left more questions than answers. This might just be my logical brain thinking, but wouldn't plays Arby was trying to save not have existed before 21st Century Nat was sent back in time? And how is the modern day Arby actually Burbage? Is he some kind of immortal entity or just a descendant? Who was the boy at the beginning with Arby who recognized Nat's value? If Arby was a descendant, was the legacy just passed down or was there a whole organization looking for a Nathaniel Field? How did the time travel even work? Also, Nat's present time friends should have been way more skeptical of Nat's story. They practically figured out what was going on with what, their smarts? Wow, that was a lot of questions. See? More questions than answers with that ending. Over all, it was a eh book. I absolutely hated this book! Now this might just be me but I mean it was horrible and old fashioned and reminded me of old tales like little women and black beauty and the wisp in the willow. Now this might just be me but I hate these types of books but I had to read it because we read it in class and it kind of put me of reading stuff like throne of glass which I love and wanted to read but after reading a bit of this I would like pick up a book and read a few pages and then put it down becaus I absolutely hated this book! Now this might just be me but I mean it was horrible and old fashioned and reminded me of old tales like little women and black beauty and the wisp in the willow. Now this might just be me but I hate these types of books but I had to read it because we read it in class and it kind of put me of reading stuff like throne of glass which I love and wanted to read but after reading a bit of this I would like pick up a book and read a few pages and then put it down because it just makes me not want to read. Though this book is not for me, if you like Shakespeare then this is the book for you but me personally, I didn't like it. If you liked it then there is no reason for you to not like this book, I you are entitled to your own opinion but for me this book just didn't excite me. There was a few parts like with the thief before the play that did have me sitting on the edge of my seat but I just don't think this book was for me. We read this in my class so it took me a while to read but I think that if I had read it by myself like usual I would probably stopped reading but maybe I would have found it more enjoyable because I could read it faster and remember things more easily. I am a bit disappointed my first review on good reads was bad so I'm now going to review the good parts of it. The writing was good and there was some sophisticated language was in there that I couldn't even read. The storyline was ok and there was some parts that I did actually want to know what happened like when the Nat from the other world got the plaque. Join Nat (Nathan) Field as he, Arby, an eccentric and mysterious dramaturg, and a modern day all-boy's troop journey to London to perform 'A Midsummer Night's Dream' on the Globe Stage. Nat is transported to 1599, and ends up becoming Shakespeare's protégé and in turn, playing Puck onstage. However, what causes Nat to end up back then, what happens while he's in another time to modern Nat, and an importance of family, comradery and history all combine together in this story. The book is very goo Join Nat (Nathan) Field as he, Arby, an eccentric and mysterious dramaturg, and a modern day all-boy's troop journey to London to perform 'A Midsummer Night's Dream' on the Globe Stage. Nat is transported to 1599, and ends up becoming Shakespeare's protégé and in turn, playing Puck onstage. However, what causes Nat to end up back then, what happens while he's in another time to modern Nat, and an importance of family, comradery and history all combine together in this story. The book is very good at paying attention to not only Shakespeare, his life, family, finances and writing, but also of the very real people that inhabited his world including her majesty, Queen Elizabeth the first. The book also focuses a lot on maintaining historical accuracy of the 1500's in terms of disease, the tower of London, clothing, food, drink, the arts, and political figures and influence on the arts. The book did hit a bit close to home in that Nat's parents have both died, and specifically, his father and father figures in the piece are very important. The relationship that builds up between Nat and master Shakespeare is very heart-felt. The book does also talk about the very real person of Nathan Field. Look him up (after you read the book) so it doesn't give anything away. The reason why this book is probably no longer on many shelves is because the book is set in 1999. Though it doesn't mention much aside from the year in terms of fashion or pop-culture, I would like the author to simply change a few words to bring it forward in terms of years, republish it and the book would probably do well again in circulation. It was one fine, sunny day, a few months back, and my family and I were visiting the library. (actually I don't remember what the weather was like but you know what I mean XD) I had my library bag over my shoulder, it was already half (???) full. I was walking through the aisles with my Dad and suddenly he stopped. He pulled a average sized grayish book from the shelves, took a glance at the inside cover, and plopped it down into my bag. It was called 'King of Shadows'. We got home later that day and into the library stack on the bottom shelf of our tall, brown bookshelf in the corner of my room. Anyway, this was a pretty good book. I enjoyed it. Shakespeare and England in the 16th century was a big part of it. I do have a complaint though. The language was a little spotty in places, but it wasn't too bad, which was good! I think there was a total of maybe 6 (???) bad words throughout the book. There was a little bit of romance in this book, though not much and it was towards the end. I think my favorite character was Will Shakespeare! My favorite parts was definitely when they were acting/rehearsing. It was very entertaining to read. The book was also very descriptive, I could picture what was happening in my head most of time! "King of Shadows" is Susan Cooper's tribute to her husband, Hume Cronyn. The dedication of the book is to him, 'For my actor'. Nat Field has arrived in England with his acting troupe to perform at the "new" Globe Theater in London. Upon his arrival he falls very ill with subsonic plague and when he awakes from a fevered sleep he is no longer in the present but back in time in Elizabethan England. He is an actor in this lifetime too and he meets and works with the real William Shakespeare. Through "King of Shadows" is Susan Cooper's tribute to her husband, Hume Cronyn. The dedication of the book is to him, 'For my actor'. Nat Field has arrived in England with his acting troupe to perform at the "new" Globe Theater in London. Upon his arrival he falls very ill with subsonic plague and when he awakes from a fevered sleep he is no longer in the present but back in time in Elizabethan England. He is an actor in this lifetime too and he meets and works with the real William Shakespeare. Through their relationship, Nat finds help in the 16th century with his life in the present. This is a title that boys who read fantasy enjoy although this new cover art puts guys off this title. Susan Cooper has written for the theater and collaborated closely with actors. She honors the traditions of the theater with this book. It's been almost 14 years since I first read King of Shadows yet I don't think I'll ever outgrow it. As an impressionable teenager, this book was a fascinating introduction to the magic of Shakespeare and theatre, as well as to the power of words to move and heal. The relationship that develops between Nat and Shakespeare is unbearably beautiful, effortlessly bridging across the 400 years that separates them in reality. Every moment they share betrays a deep connection weighed down with a linger It's been almost 14 years since I first read King of Shadows yet I don't think I'll ever outgrow it. As an impressionable teenager, this book was a fascinating introduction to the magic of Shakespeare and theatre, as well as to the power of words to move and heal. The relationship that develops between Nat and Shakespeare is unbearably beautiful, effortlessly bridging across the 400 years that separates them in reality. Every moment they share betrays a deep connection weighed down with a lingering sense of poignancy. When Nat is cruelly wrenched back to his own time towards the end, I ached for him. Even now, thinking of it brings back that same crushing ache. There's not much else I can say; there are no words to articulate why exactly I love this book so much or why it will continue to stay with me long after its time. Shakespeare geeks, Bardinators, shall revel in Susan Cooper’s time exchange novel. A plethora of well-researched historical background lends an authenticity to the story that makes this a memorable read. It’s tricky business creating a believable time slip plot, especially when one the main characters carries so much leverage. How does one create a genuine Shakespeare, a man of so much influence, yet so little is known of him? Susan Cooper manages to do so amazingly well, creating warm personalit Shakespeare geeks, Bardinators, shall revel in Susan Cooper’s time exchange novel. A plethora of well-researched historical background lends an authenticity to the story that makes this a memorable read. It’s tricky business creating a believable time slip plot, especially when one the main characters carries so much leverage. How does one create a genuine Shakespeare, a man of so much influence, yet so little is known of him? Susan Cooper manages to do so amazingly well, creating warm personality effervescent with authority and mystique. Nat Field trades places with his 16th century counterpart for one week, playing Puck opposite Shakespeare as Oberon. Well-written, especially impressive in historical details.